This collection was found in the Archives in 2001 (accession number 2001: 083). The Stewart A. McDowell Collection is organized in two series: Correspondence and Miscellaneous. Each series is arranged alphabetically. Stewart A. McDowell was born in Morton, Delaware County, Pennsylvania on May 31, 1895. 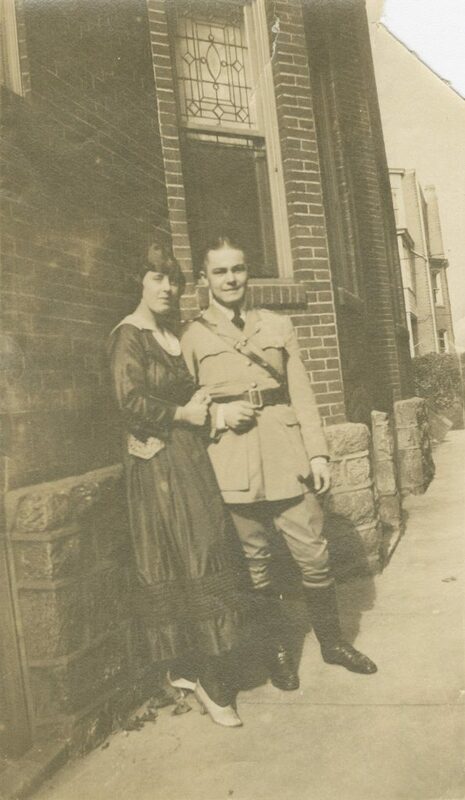 During World War I he went to France in 1917 to join the the Lafayette Flying Corps. Once the United States entered the war, McDowell joined the Army Air Service, ending the war as a second lieutenant. He stayed in France until 1921, when he returned to Philadelphia. McDowell worked as a salesman in the Chemical Industry living in Lansdown, PA. He died on September 15, 1960 and is buried at Arlington National Cemetary. The Stewart A. McDowell Collection consists of letters send to McDowell from family and friends between 1917 and 1921. The bulk of the letters comes from his uncle, James Dailey, in 1921 and consists of requests for McDowell to return home from France. Dailey also send a number of newspaper clippings related to the war effort and local interests. In addition to letters from family and friends, correspondence from various other sources (some from overseas) directly related to the war or debts occured by McDowell. The collection also contains a number of unique illustrated pieces (e.g. a log abstract from R.M.S. Baltic, and a Sherwin-Williams paint advertisement). An envelope from James Thompson contained a World War I era condom. There is no apparent connection between McDowell and the University.